Well now, it seems that the whole blog at Salt + Light Television has been wiped off the web page. Can this be anything else but an admission that it is likely full of plagiarism? One of the items eliminated was Thomas J. Rosica's "Message" wherein he stated that he had no intention of suing this writer. Thanks to Internet archives, I post it here below, for permanent record. A blatant misrepresentation of the facts. He had every damn intention of suing me. And the proof is in his Fogler, Rubinoff LLB pro-bono lawyer, Nina Perfetto's letter. "We reserve the right to commence litigation against you regardless of any apology or retraction but assure you that in the absence of an apology or retraction, the damages claimed will be significantly higher." The letter clearly said that even if I had complied, they reserved the right to sue, regardless. There are words for men such as this. My admiration, respect and thanks for going nose to (prodigious) nose with with this bully. Are they concerned with litigation? Something is up. The stupidity of the Board at S and L boggles the mind. However, their behaviour is logical. Why should they care abut theft and fraud if they cared not about heresy? Why would they care care now, if they cared not that Rosica, in a most outrageous CLERICAL manner, obtained free legal from a very expensive law firm in his grossly sinful attempt to silence and bankrupt you and your wife. Perhaps Rosica will have the decency to send you a cheque to cover your costs? Perhaps he will have the decency to publicly apologize to you and your wife? We await to see some contrition by this tragic caricature of a Catholic priest. RE: "...it was never my intention to sue,..."
Sadly, it seems highly likely that this man truly has no grasp of the truth and fundamental facts of actual reality. The struggle to find salvation from that condition is extraordinary. Let's see - lying - check. Plagiarism - check. Well no wonder Francis selected Rosica for a Vatican position. To know truth and to reject it for some temporary gains, where one's job description is "one who follows and leads people to salvation in Jesus Christ", must cause incredible damage to one's soul. Priest Rosica, if you are reading this, know that choices you have been making matter to those who have been affected, and to your salvation, and that I wish you well. I hope you turn away from evil. Rosica lied about having an advanced Degree also. I'm convinced that the 100 years granted to Satan (in the vision seen by Pope Leo XIII) by God to try to destroy His Church are now over, and the many evil people in the clerical and secular world are nowadays not only being exposed for who they are, but are seeing their sinful worlds crumble!! God is allowing this in His mercy so that they can be shaken into repentance and thus salvation of their souls! Look for many more to fall! But we ourselved must remain steadfast and resolute in prayer and sacrifice for their conversion and the destruction of their evil works!!! The Baby Jesus bless and protect us! In the second paragraph of his message, Fr. Thomas Rosica says"
"I fully support the teaching of the Church....."
That is such a joke! Fr. Rosica doesn't care at all about the teaching of the Church. He most certainly doesn't believe (according to his own statements) that homosexuality is intrinsically disordered. The Church teaches that homosexuality is intrinsically disordered. Then he actually mentions...."beautiful unchanging doctrine." That's just defies logic. Since when does he care about doctrine? And yet those of us who actually DO care about doctrine are the ones who are supposedly engaging in calumny (according to Rosica) when we point out that Fr. Rosica supports the homo heresy. M.Ray, you mean this guy that celebrated the fact that Francis didn't have a "disordered attachment" to the teachings of the Faith, or tradition, or scripture? 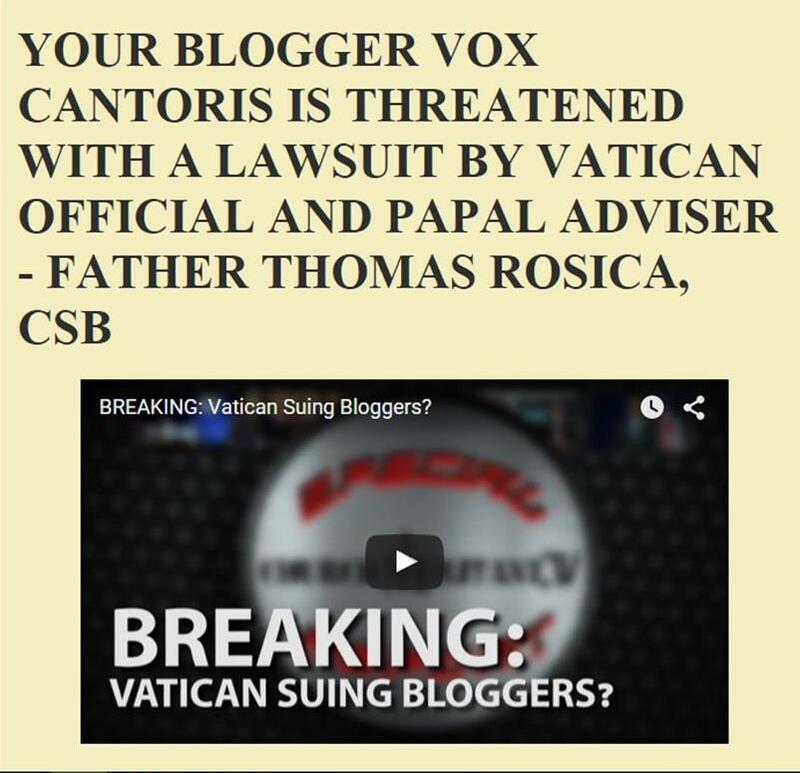 As a long time reader of your site, Vox, I have long admired your fortitude in the face of persistent attempts by the LIAR/PLAGIARIST Rosica to try to silence you. It was maybe 4 or 5 years ago, when it appeared that the LIAR/PLAGIARIST Rosica was going to prevail. In the midst of that injustice, you held your ground and point blank refused to backdown. I admired your resolve then and the passage of time has proven you right. If you could indulge me here. In the midst of the Lance Armstrong affair, there was literally only one commentator who consistently questioned the narrative constructed around the LIAR/Cheat Armstrong. That man was journalist David Walsh. It takes a special resolve to hold fast - when all the forces ranged against you are claiming the complete, mendacious, opposite. You were right then, and time has proven you right since, Vox. The rest of us owe a debt of gratitude to you for your fortitude and resolve. Rosica will be reading this. I sincerely hope for your personal safety sake Rosica that our paths never cross in this life. I'd break your neck if our paths did ever cross - and that is a promise. The Knights of Columbus appear to be buckling and are now re-evaluating their love for Rosica. What a bloody liar this donkey is.. Repent Rosica, Repent and after you do that go get a job! I was threatened with a suit from a Legion of Christ affiliated school for discussing online with several others involved exactly what happened to my child and theirs. We waited for the suit hoping to tell a judge the entire story. Nothing came of it and we certainly did not apologize for telling the truth. Tom Rosica is the Canadian version of Mark Shea, only sneakier.